Odd Man Out is a terrific film. It might not be — as the lobby card above boasts — “the most exciting motion picture ever made,” but it’s a damned good one, with masterful direction by Carol Reed and a hypnotic lead performance by James Mason. Mason plays a revolutionary leader named Johnny McQueen, fresh out of the clink and planning a big heist. The Irish Republican Army is never mentioned outright — McQueen’s group is simply called “the organisation” — but the film takes place in Belfast, so you can connect the dots, if you care to. However you choose to interpret the obfuscation of the I.R.A. 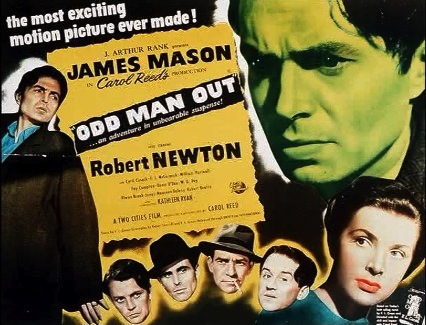 in Odd Man Out, there’s little denying that it’s an apolitical film, more concerned with one man’s existential journey than with making any kind of political statement. In the first scene of the film, we see Johnny McQueen holed up in a safehouse, planning a payroll robbery of a textile mill with his boys. Also present is the woman who loves him, Kathleen Sullivan (played by Kathleen Ryan). Things look and sound all right until one of Johnny’s boys approaches him, and tells him he’s concerned about Johnny’s ability to handle the job. Johnny was in prison for several years for blowing up a police station. He’s only been on the lam a little while, and confined to the safehouse the whole time. Johnny brushes off his lieutenant’s concerns, but as soon as the plan is in motion, we realize that Johnny might have been wrong to lead the robbery. In a subjective sequence, we see the busy streets of Belfast from Johnny’s point of view. Cars whiz past, streetcars with grinding wheels pass by close enough to touch, people hurry to and fro, and the whole smoky mess looks too cramped and too large at the same time. If you’re a fan of realistic heist movies, the robbery scene in Odd Man Out will meet with your approval. It’s not overly complicated, and it’s accomplished quickly, but it’s full of tension, especially since Johnny seems about to crack at any moment. He and his boys make it out with the money, but a mill guard tackles Johnny as he hesitates on the front steps of the factory. The two men wrestle, and each takes a bullet. The wounded Johnny falls off the running board of the getaway car, and his boys lose him in the confusion. James Mason has little dialogue in the film, but his performance is amazing. He feels guilt, remorse, confusion, anger, loneliness, and even suffers hallucinations as he loses blood and seems to always be marching toward death. His performance is sympathetic, but keeps the viewer at a distance. This isn’t a film noir about a regular Joe who’s caught up in circumstances beyond his control. Every move Johnny made in his life has led him to this point, and he knows it. Aside from Mason, most of the actors in the film were regulars on the stage of the Abbey Theatre (which could be why none of their accents sound quite right — they’re all from the wrong end of the island). Fans of British cinema and television will recognize plenty of them. Reed’s most famous film is The Third Man, which he made in 1949. It’s been awhile since I’ve seen The Third Man, but I thought Odd Man Out was a stronger picture. Mason is a more compelling central presence than any of the actors are in The Third Man, and the music, cinematography, editing, and direction are all tighter in Odd Man Out. Odd Man Out is a difficult film to classify. It starts out as a straightforward crime picture, but by the end of the film, Johnny’s journey takes on a surreal quality. A scene late in the picture in which he’s sheltered by a mad painter (Robert Newton) has the quality of a lively Samuel Beckett play. The film was nominated for the Golden Lion at the Venice Film Festival in 1947, and received the BAFTA award for Best British Film in 1948. Fergus McDonnell was nominated for an Academy Award in 1948 for best editing, but Francis Lyon and Robert Parrish ended up winning for Body and Soul. Posted in 1947, January 1947 and tagged Ann Clery, Arthur Hambling, Beryl Measor, British Cinema, Carol Reed, Cyril Cusack, Dan O'Herlihy, Denis O'Dea, Drama, Eddie Byrne, Elwyn Brook-Jones, F.J. McCormick, F.L. Green, Fay Compton, Fergus McDonell, Film Noir, General Film Distributors, Herbert Smith, James Mason, Joseph Tomelty, Kathleen Ryan, Kitty Kirwan, Maura Milligan, Maureen Cusack, Maureen Delaney, Odd Man Out, Phil C. Samuel, R.C. Sherriff, Robert Beatty, Robert Krasker, Robert Newton, Roy Irving, Two Cities Films, W.G. Fay, William Alwyn, William Hartnell. Bookmark the permalink.